Long-term hunger striker Samer Issawi is at risk of death after refusing food for 187 days, Palestinian Knesset member Ahmad Tibi said Monday. 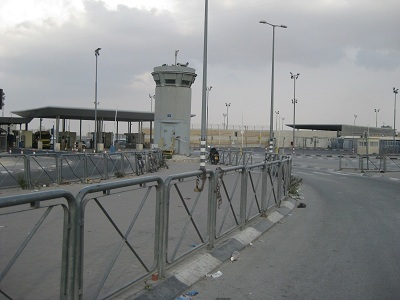 Tibi, who visited Issawi in Ramle prison clinic, said the prisoner’s health condition is critical. 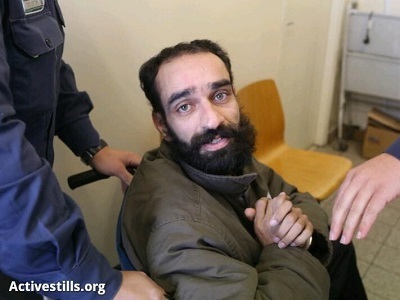 In a statement, the MK described Issawi as pale and skeletal, weighing only 48 kg. From a wheelchair, Issawi told Tibi he was determined to continue his strike. “The only choices I have are to triumph or die a martyr. I feel I am closer to martyrdom, and the battle I am fighting isn’t a personal one as I am seeking to protect national accomplishments achieved within the Shalit deal,” he said. Issawi was released in the Oct. 2011 prisoner swap agreement between Israel and Hamas, which secured the release of Israeli soldier Gilad Shalit from Gaza. He was rearrested on July 7 and accused of violating the terms of his release by leaving Jerusalem. Israeli prosecutors are seeking to cancel his amnesty and detain him for 20 years, the remainder of his previous sentence. Issawi told Tibi he is willing to be tried in a magistrates court and to serve a short sentence for entering areas “which are in the first place part of my homeland,” but he will not agree to serve another 20 years in Israeli jails. Tibi informed the prisoner he had contacted Arab and international officials and human rights groups to lobby for his release. “We want you alive between us so you can continue to fight for your people and homeland, and we are looking forward to visiting you at home after you triumph in this hunger strike God willing,” he told Issawi. On Monday, activists gathered outside Ramle prison to demonstrate in solidarity with Issawi and other prisoners on hunger strike.